Astronaut photographs ISS039-E-9383 and ISS039-E-9933 were acquired on March 5, 2014 with a Nikon D3S digital camera, and are provided by the ISS Crew Earth Observations Facility and the Earth Science and Remote Sensing Unit, Johnson Space Center. The images were taken by the Expedition 39 crew. The images in this article have been enhanced to improve contrast. The International Space Station Program supports the laboratory as part of the ISS National Lab to help astronauts take pictures of Earth that will be of the greatest value to scientists and the public, and to make those images freely available on the Internet. Additional images taken by astronauts and cosmonauts can be viewed at the NASA/JSC Gateway to Astronaut Photography of Earth. Caption by M. Justin Wilkinson, Jacobs at NASA-JSC. 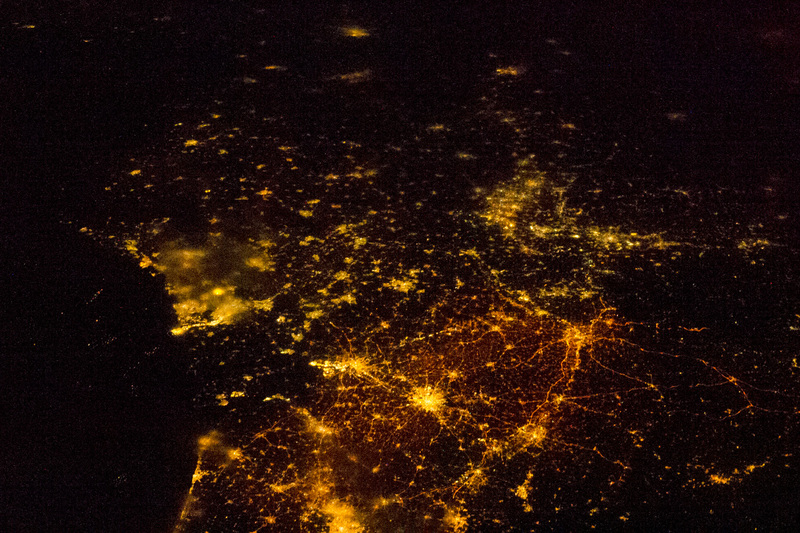 An astronaut on the International Space Station took this night photograph of two of Belgium’s major metropolitan areas. Antwerp is a major European port located on the Scheldt River, which appears as a black line angling through the lights. The city has access to the Atlantic Ocean, and its extensive dock facilities are even more brightly lit than the city center. Brussels is the capital and largest city in Belgium, and also the de facto headquarters of the European Union. 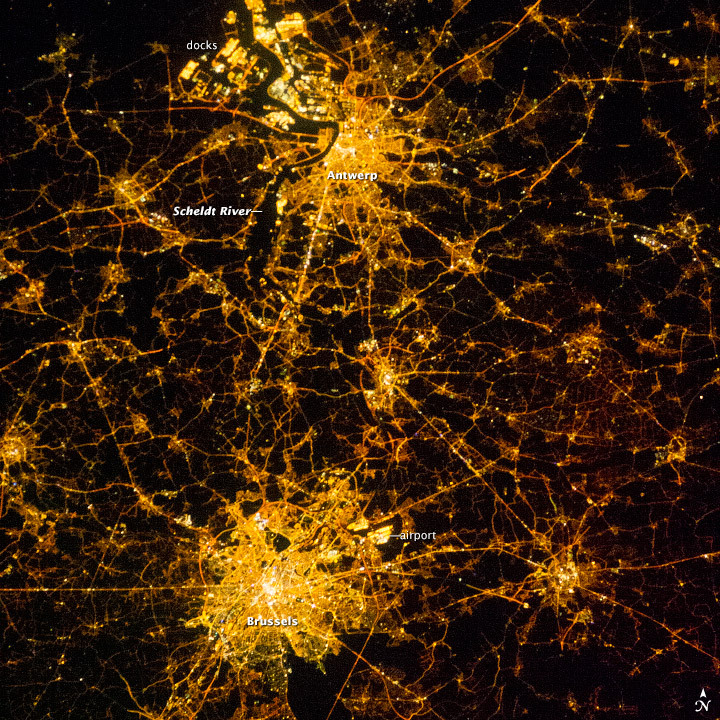 Brilliant points of light are the city center and the Brussels National Airport. Developed roadways appear as straighter, brighter lines radiating from the two cities. About a minute before this photo was taken, an astronaut captured a wider contextual view of Belgium, Netherlands, and northwest Germany. Taken with a shorter (wider-angle) lens, the photo gives a panoramic view as the ISS crossed into Europe from the Atlantic Ocean. Another photo taken from the ISS shows the nearby city of Liége in 2012.